How to Make Space on iPhone If You Need More Space? How to Make Room on iPhone If You Need More Space? How to make more space on iPhone? This guide will walk you through iPhone running out of space issue before you pay extra for a higher-capacity iPhone handset. Have you ever encountered "iPhone Storage Almost Full", "Insufficient Storage to Download", "Cannot Record Video" or "Cannot Take Photo" message when using iPhone? 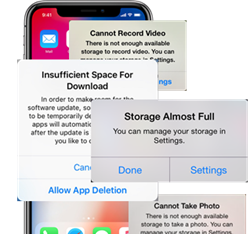 When this kind of popup shows, it indicates that your iPhone storage space is hitting bottom and you need to take measures immediately to make room for iPhone for smooth operation without interrupting by such annoying notification. How to make space on iPhone? That's totally not a hard task if you follow this guide. How to Make Room on iPhone? ★ Manage and organize 12 types of iPhone data in order. When your iPhone automatically reminds you with a notification that there is not enough available storage space for software update, recording a video or taking a photo, it also suggests you to manage your iPhone storage in Settings. In the last post about how to solve iPhone storage almost full problem, we have listed various available ways to free up space on iPhone that you can also make use of here. They are operational to manually remove specific contents on iPhone or reset some settings using finger one by one after checking which apps occupy iPhone storage space most anywhere anytime, but the question left there is that how to make space on iPhone without abandoning some important data and sacrificing image/video quality. If you need a new way that helps create space on iPhone without losing data or changing everything, you can try DearMob iPhone Manager. 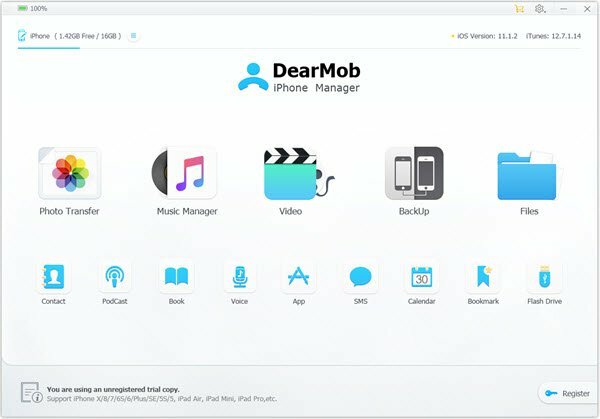 DearMob iPhone Manager is a versatile iPhone backup software with U.S. military-grade encryption method to allow bidirectional data file transfer to/from computer or one-click backup iPhone to PC/Mac to safeguard iPhone data files when you need to delete them to make more room for iPhone. By transferring or backup iPhone data to computer before deleting them, your precious data like family photos, videos recordings with friends and business contacts are protected forever. And you can also enjoy limitless HDR/Live photos and 4K shots in high definition without worrying their huge storage occupancy. So, let's see how the different DearMob iPhone Manager helps create space on iPhone. How to Make Space on iPhone via DearMob iPhone Manager? The following processes are available with the premise that you have downloaded, installed and launched DearMob iPhone Manager on your computer. After USB-connecting your iPhone to computer, you can view your iPhone photos, videos, music, etc and check your iPhone storage by simply clicking the specific iPhone file type to determine which one should be deleted to make room on iPhone. When DearMob iPhone Manager gets in touch with your iPhone, all your iPhone data files will be showed in one interface. Simply choose one file icon and you can manage iPhone file data including transfer video, music, photos, etc between iPhone and computer, delete unwanted files and edit iPhone data information. Here, we take Photo Transfer as an example to show you how to make space on iPhone by transferring and deleting photos. Step 1. Click on Photo Transfer icon on the main UI of DearMob iPhone Manager to access your iPhone photos. Step 2. Choose the photos you no longer need one by one or just in bulk. Step 3. Click on Export button to transfer photos to computer in case that you need to recover what you have mistakenly deleted. If you assure the photos you chose are useless, you can just ignore this step and jump to step 4. Step 4. After transferring, delete the photos you choose by clicking on Delete Photo on the top bar of DearMob iPhone Manager. Then, DearMob iPhone Manager will delete these files on your iPhone quickly to create more space for iPhone. This way helps batch delete iPhone photos forever without tapping photos one by one with finger and then going to "Recently Deleted" in Albums. Notice: DearMob iPhone Manager is an offline service that will never track your iPhone information. You are the owner of your data, of course. Step 1. Keep your iPhone connected to computer and click on the Backup icon on the use interface of DearMob iPhone Manager. Step 2. 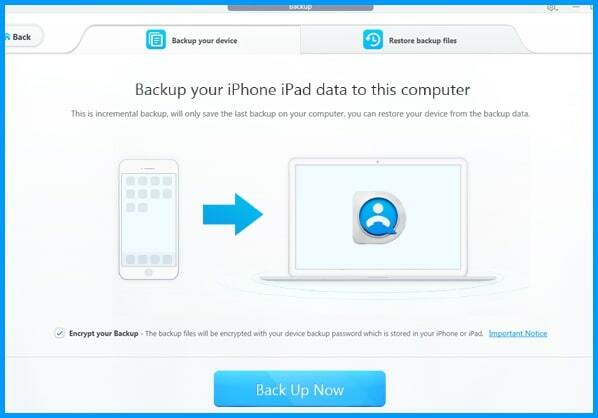 Just click on Back Up Now in the Backup your device section to backup your iPhone, the backup will start immediately. Kindly remind, you can encrypt iPhone backcup with DearMob iPhone Manager is your iPhone data is quite private and sensitive. Step 3. The backup process may take minutes based on the size of your iPhone data, so please be patient. After the backup finishes, you can just factory reset your iPhone to be a brand new gadget. Notice: Restore iPhone backup via DearMob iPhone Manager is also easy by just click on the Restore Now button. How to Backup iPhone Data Files Easily?